Anthony Preece says he owes his £7,600.58± PPI payout to his son. SUCCESS STORY – It felt like I’d won the lottery! When Margo Flanagan decided to see if she had PPI attached to any of her former finance agreements she thought she might get £100 to £200 if it was found he had been mis-sold. “I couldn’t believe it when the letter came to tell me how much money I would be getting back. It felt like I’d won the lottery,” she said. “It was the TV advert that prompted me to make the call,” she said. 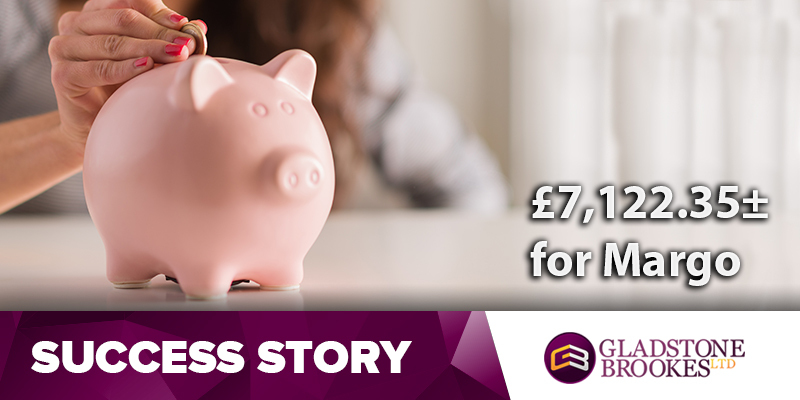 The resulting investigation found that PPI had been mis-sold on a Bank Of Scotland loan and Margo ended up with £7,122.35± compensation. Said Margo: “I had no idea whether or not I had been mis-sold PPI at any time over the years, but the service from Gladstone Brookes made the whole process so easy. Lee Childs had tried to claim back PPI on his Capital One credit card before and got nowhere. 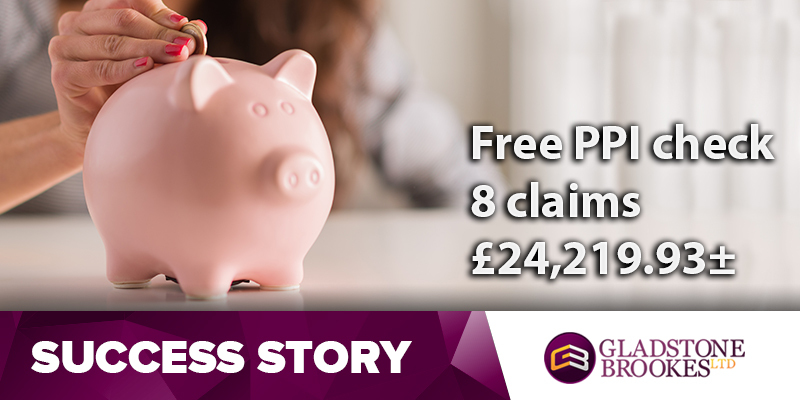 Ann Brookes had been thinking about making a PPI claim for two years, but had never actually got around to it. SUCCESS STORY – It was great service! Sean Turner had no idea whether or not he had PPI attached to any of the finance agreements he had signed in the past, but when he saw the Gladstone Brookes TV advertisement he decided he had better check to find out. Fred Davies had tried to claim back PPI from Lloyds Bank himself a few years ago, but was unsuccessful. It’s not always the big sums of money we recover that make our clients happy. For some £1,400 is a god-send. 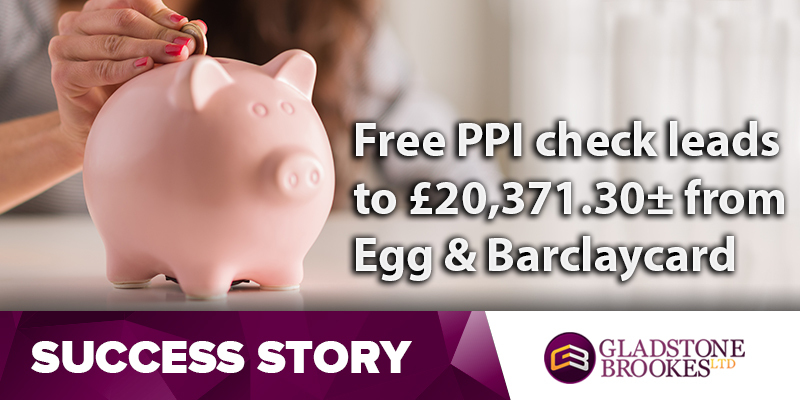 Mark Osmond is delighted with the result of his Free PPI check after picking up a total of £20,371.30± for mis-sold PPI on an Egg loan and a Barclaycard. SUCCESS STORY – Now I can get on the property ladder! For Claire Taylor the decision to answer a Facebook advert offering a free PPI check was to change her life and give her the deposit to buy her first home. Zoe Cawthorne successfully claimed back PPI on an HSBC loan on her own but was dismayed by the amount of time it took. “It was actually quite a recent one and I had all the paperwork. I did it by letter and eventually got my money, but it took ages for them to sort it out,” she said.